Spend less on the BBs and more on the GGs at this tidy little budget pleaser just 3 miles from Haydock Park Racecourse. 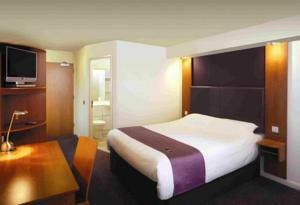 If you intend to spend most of your holiday budget on a day at Haydock Races, then you’ll be pleased to learn that the Premier Inn offers quality accommodation at cheap rates, leaving you in a better position for throwing away the best part of your wages on the track rather than on the often needless luxuries of more lavish hotels in the area. Located just off the A580, East Lancashire Road just three miles from Haydock Races, the hotel boasts the now signature comfy beds and kids get to eat a free full breakfast, when accompanied by an adult eating a full breakfast.